It is almost time to bring out your checklist and start the annual spring cleaning inside your home, but with the weather warming up and the growing urge to spend more time outdoors, you may want to start your annual cleanup outside this year. Backyard spring cleaning helps you prepare for outdoor entertaining, makes your yard more enjoyable, is an essential part of preparing for your spring planting and motivates you to do all of those yard maintenance tasks that you have been putting off. Here are 20 things you should add to your backyard spring cleaning list this year. 1. Clean your fire features. 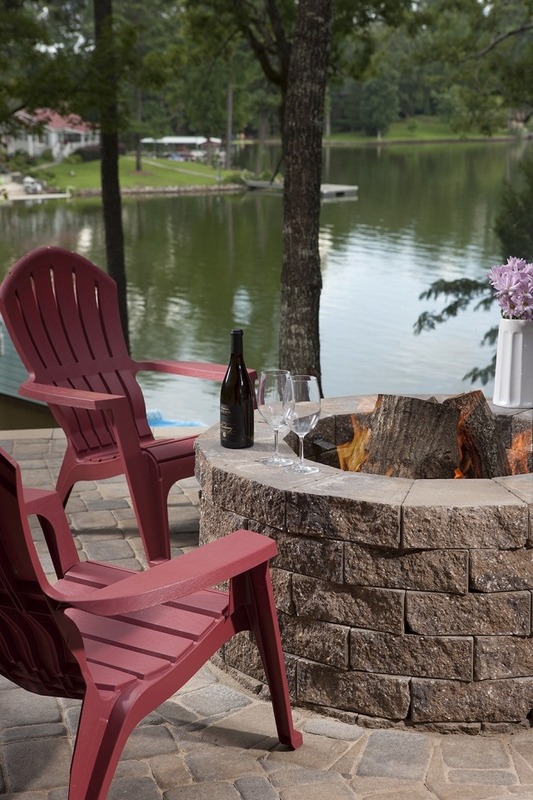 If you have been using your patio fireplace or backyard fire pit throughout the winter, it is probably time to give it a good cleaning and safety check. This will help you prepare for the next season of entertaining, will make your outdoor living areas look cleaner and will help ensure the safety of your family and guests. 2. Clean your patio refrigerator. Most of us clean out the refrigerators in our kitchens at least a couple of times each year, but it is easy to forget that second refrigerator out on the patio. Throw out expired food, clean up any spills and organize the contents to make outdoor entertaining easier. You likely cleaned your gutters before the rainy season to prepare for whatever precipitation Mother Nature saw fit to give Southern California this time around. So now it is time to clean them out again, since the rain and wind can fill them with leaves and debris. 4. Clean your eaves and fascia. Cleaning the cobwebs and dust from your home’s eaves and fascia is another good addition to your backyard spring cleaning checklist. Take this opportunity to also look for dry rot, evidence of termites or other damage. It might be time for a termite inspection or some repairs to keep your house well maintained. 5. 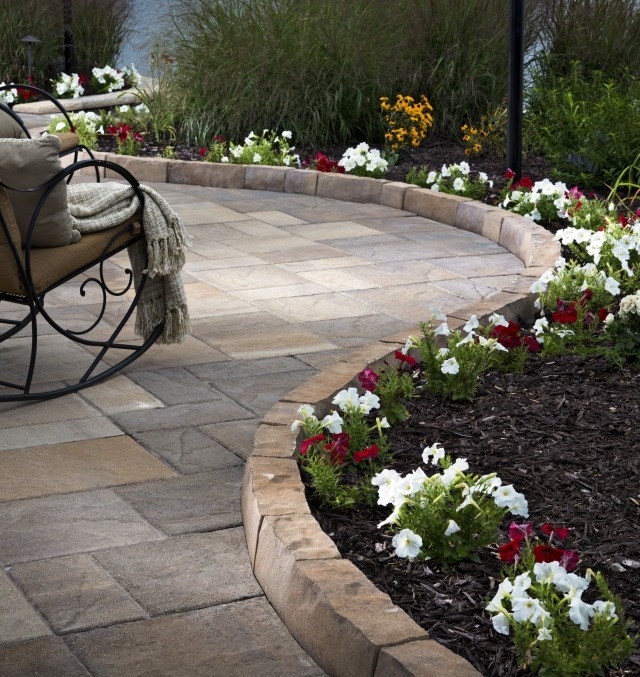 Fill in cracks in concrete walkways, driveways or patios. Filling in the cracks will never make your concrete look as good as new, but it will make it look better and will inhibit weed growth. While pulling weeds anywhere in the yard is not exactly fun, it can be particularly difficult to pull them out from the root when they are growing in cracks in concrete, which pretty much guarantees they will be coming back if you do not fill the cracks. 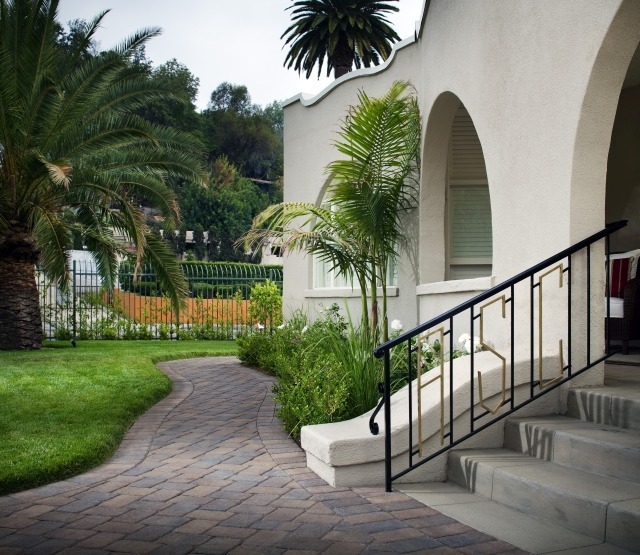 If your concrete surfaces are particularly cracked, or if you are just tired of filling the cracks and pulling weeds growing in those cracks, this is also a good time to consider replacing your concrete driveways, patios or walkways with attractive, low-maintenance paving stones. 6. Clean out and organize your shed. Whether it is a garden shed or a storage shed, spring is the perfect time to clean it out, give away or sell unused items, clear the cobwebs and make it more organized. You should consider shelves, tool hangers, seed storage solutions or other options that fit the way you use your shed and will make it easier and more convenient to quickly find and retrieve the tools or other items you need. 7. Remove clutter in your yard. 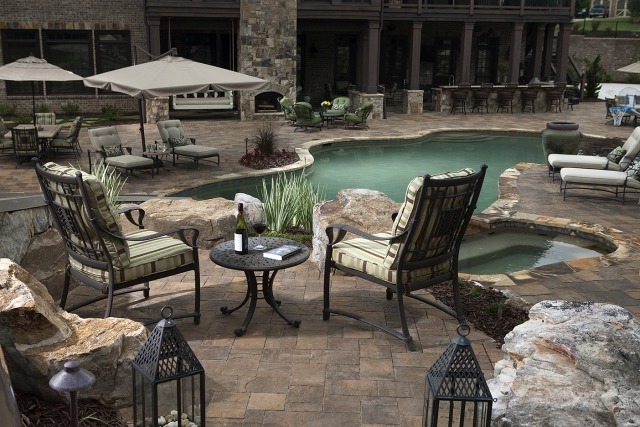 While you are in decluttering and organizing mode, it is a good time to also take a look at your outdoor living areas to see if there are items you can put away or remove completely. Stacks of unused pots, a container garden that has grown too large for your patio, toys left behind by your dog or child, and yard maintenance tools that never seem to find their way to the garage may now fit in your newly organized shed. If not, you might want to consider a deck box for additional storage for things you want to keep but that do not need to be visible when you entertain guests. 8. Clean your dog house and wash dog beds. We clean our homes and wash our bedding regularly, but most of us are not quite as good about cleaning the homes and beds we have for our dogs. This addition to your backyard spring cleaning list can actually help protect your dog from spider bites and reduce the fleas in your yard, so there are more reasons than simple cleanliness to add this to the list. 9. Clean your patio furniture and cushions. If you keep your patio cushions in a deck box or closet, they may stay fairly clean, but now is a good time to check them and see if they are in need of cleaning or repair. This is also a good time to oil wood furniture that requires that type of care, strip and stain wood furniture that has seen better days, repaint metal furniture or finally replace the webbing on those sagging lawn chairs. If part of your cleaning plan involves spraying your patio furniture down, keep in mind that a good pressure washer can help you save water when compared to using a garden hose. 10. Clean out your flowerbeds and borders. The wind and rain from Southern California’s rainy season may have blown excessive leaves and debris into your garden beds and borders. Leaves and other organic materials can actually be left alone to break down and add nutrients to your soil. However, if you do not like the look of decaying leaves, you can clean them out of your flowerbeds or add a layer of mulch or wood chips on top of them. It is probably time to add a layer of ground cover in your borders and flowerbeds anyways. 11. Clean, stain or paint your fence. Wood fences need a new coat of stain or paint every now and then, and all fences need a good cleaning at least once per year. You can use a scrub brush, a garden hose or a pressure washer to accomplish this. Or to make things even easier, you can hire someone to clean your fence for you. Unless you have a good amount of time and patience, you may also want to hire out any staining or painting that needs to occur. Do not underestimate just how much sprucing up your fence can change the overall look of your yard. You will definitely want this one on your spring cleaning list. 12. Clean, stain or paint your deck. If you have a wood deck, spring is the perfect time to do an overall assessment and see if it needs any minor repairs, staining or painting. You may be able to get away with pressure washing it or scrubbing it with a deck brush, or you may need to take that extra step of applying another coat of stain or paint to keep it looking its best and ensure that it is ready for outdoor entertaining. 13. Clean and brush your artificial grass lawn. If you have this low-maintenance lawn option, then you likely already know that all it really needs to keep looking lush and inviting is to be sprayed down and groomed every once in a while. If you have not cleaned your synthetic turf in a while, now is a good time to give it a good spray down with your garden hose to remove dust and debris. Follow this with fluffing up your manufactured grass blades with a broom or a handled brush. 14. Dethatch your natural grass lawn. If you have a natural grass lawn, spring is a good time to clean it up with a good dethatching. Start by setting your mower to cut a little closer than usual, and then use a convex rake to get some exercise and dethatch your lawn manually. To make this task easier, you may be able to rent a power rake from your nearest home improvement center or equipment rental yard. After dethatching, you will likely need to rake your lawn to remove the debris pulled up during the dethatching process. 15. Aerate and reseed your natural grass lawn. Since you are already dethatching it, you might as well add aerating to your spring cleaning list as well. Some folks aerate instead of dethatching with a convex rake or power rake, and some folks find it more beneficial for their lawn to employ both of these practices. Aerating allows for better flow of air and water into the soil, thus improving the health of your lawn. Most lawns only need to be aerated every couple of years, and particularly healthy lawns may only need it every four or five years. This is also a good time to remove any dead or brown patches and reseed your lawn to have it looking better by summer. 16. Top dress or fertilize your lawn. After aerating your lawn, you can then top dress or fertilize it to add nutrients to the soil. This can be particularly beneficial after aerating because the nutrients are then able to be more effectively delivered deeper into the soil. Top dressing can be accomplished with compost or soil and it can provide a number of benefits, including reducing thatch and helping your lawn handle traffic better. 17. Replace your natural grass lawn with artificial turf. Dethatching, aerating and top dressing are just three of the many chores involved in keeping a natural grass lawn looking its best. There is, of course, the mowing, weeding, watering and edging that must be done much more often. So to make your spring cleaning routine easier and less time consuming next year, you may want to consider replacing your natural grass lawn with low-maintenance synthetic grass. This will save you time throughout the year, but it will be particularly nice when you do not have to do the annual maintenance tasks that can be much more time consuming. 18. Clean your grill and grilling tools. 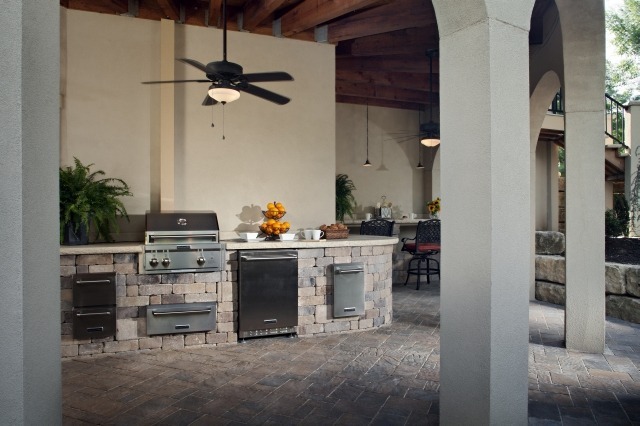 Southern Californians are lucky enough to be able to use our grills throughout the year, so it is likely that your grill and grilling tools have not been sitting around outside all winter without being used. But they could probably still use a good cleaning, so this is a good one to add to the backyard spring cleaning list. If the rain has left them a little rusty, you can scrunch up some aluminum foil and lightly scrub them to remove it. If the rust is more significant, you may want to replace them before this year’s grilling season is fully underway. Check all of your exterior lights to see if globes need cleaning, bulbs need replacing or wiring needs repair. 20. Clean your trash cans. We often overlook cleaning some of the stuff that gets the dirtiest in our homes and yards. This includes our cleaning tools, our vacuums, our cleaning appliances (like dishwashers and washing machines) and our trash cans. Dirty trash cans are an eyesore and can give off an unwelcome odor, so make sure you add cleaning your trash cans to the list. What are the must-do tasks you always include in your backyard spring cleaning list?